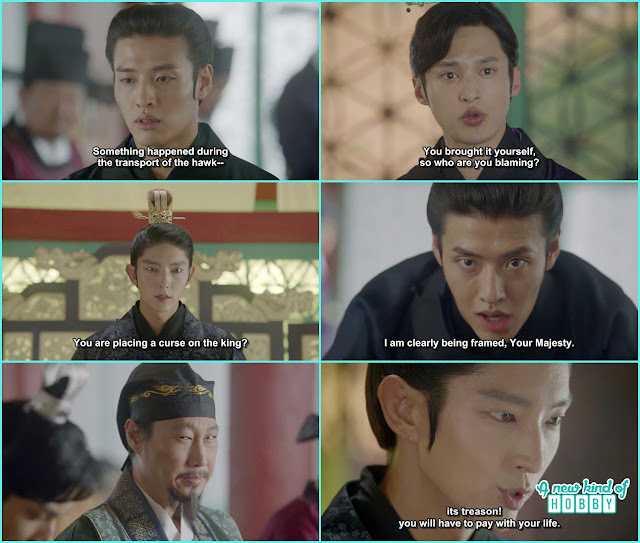 Wook didn't stop his evil acts and continued to create problems in the palace with his acts. He actually wanted to show his loyalty to the King that he is more Loyal and sincere with him then any one else. For this he bought a hawk and wanted to give it to th eking. He knew the King love to haunt the Hawks so he though it off the good idea to be on King's good side. As he bought the gift to the king and was happy that what he did will bring good to him but unfortunately the hawk turned out to be dead. 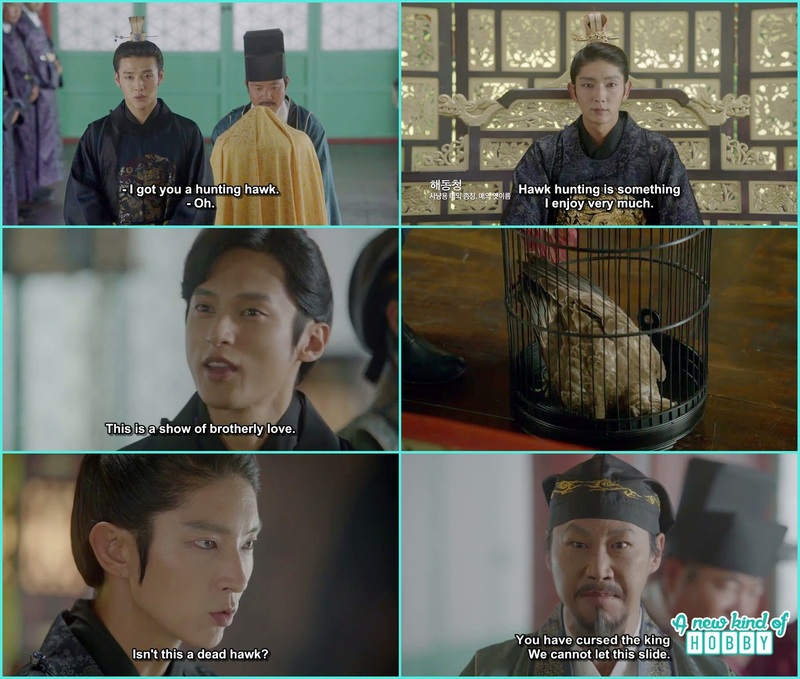 Every body on the palace noticed that Wook bought a dead hawk as the gift for the king means he wanted to spread rumors that king actually is cursed. People started to accuse Wook for bringing the dead Hawk as a gift for the King he was too shocked and startled to seeing it. Moreover his right arm little brother Wang Won was the one raise voice against him. Wook suddenly kneeled and beg for forgiveness and told his majesty that it wasn't his intention. There must be some kind of misunderstanding. We wonder who did this we doubted Wang Won and king may be one of them wanted to remove Wook from their way as they knew Wook is behind of ruining the palace and the people's life upside down. But we weren't sure who did it. King told Wook that bringing the dead hawk as a gift he is placing the king to be cursed and its Treason. He will be punished to pay with his life. It was the death sentence for Wook he begged that he is innocent and being framed for it but nothing of use. The Queen mother came to Queen Yeon Hwa and request her to take pity on her brother he is innocent and being framed she must talk to the king and save her brother no matter what. As promised to the king Yeon Hwa turn her back to her family and threw away her mother and Wook by saying that Wook had done a deadly sin and there are many people who witness it so she couldn't be of any help. It wasn't only Queen mother who stand and beg for Wook's life but also Hae Soo kneeled down infront of the king to forgive Wook. It was a shock for the king to see Hae Soo doing this for Wook. He told her not to do so as she is not feeling well and her knees hurts. Hae Soo knew the truth that it was King's doing to kill the hawk and put the blame on Wook but King didn't accept What Hae Soo said. As he wanted to punish Wook for lot many other crimes and ruining other people's life by placing conspiracies and meddling in theri affairs. He told Hae Soo what if he take back Wook's punishment but the other things he did aren't able to be forgive. He killed their elder brother King Moo then killed Eun and his wife and it wasn't the stop he also tried to chase away Baek Ah from the palace means he tried to kings arms. 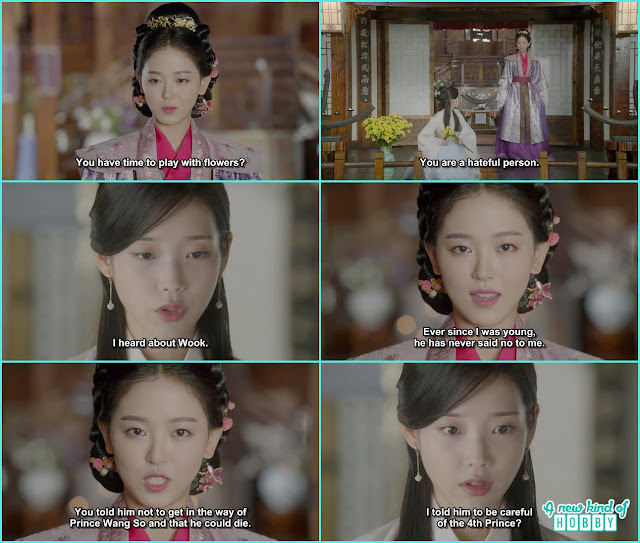 Hae Soo don't want to hear any of these as his motive that no body would assume King So to be there enemy who killed his brothers for the throne. As palace was messed up due to Wook's doing people were paying for their crimes. Queen Yeon Hwa came to see Hae Soo. 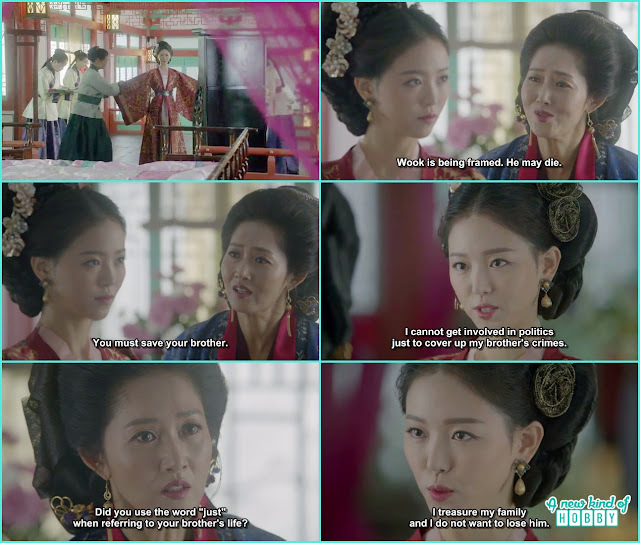 It wasn't a pleasant meeting she just accuse Hae Soo that its all her fault that Wook is suffering now. What if Hae Soo didn't have said things to Wook this day won't happen to come in their lives. Queen Yeon Hwa proved herself to be the witchy one she used harsh words and made Hae Soo realize all what happened was all her fault. Then Hae Soo remember what King Yoo also said to her that every thing started because of her. 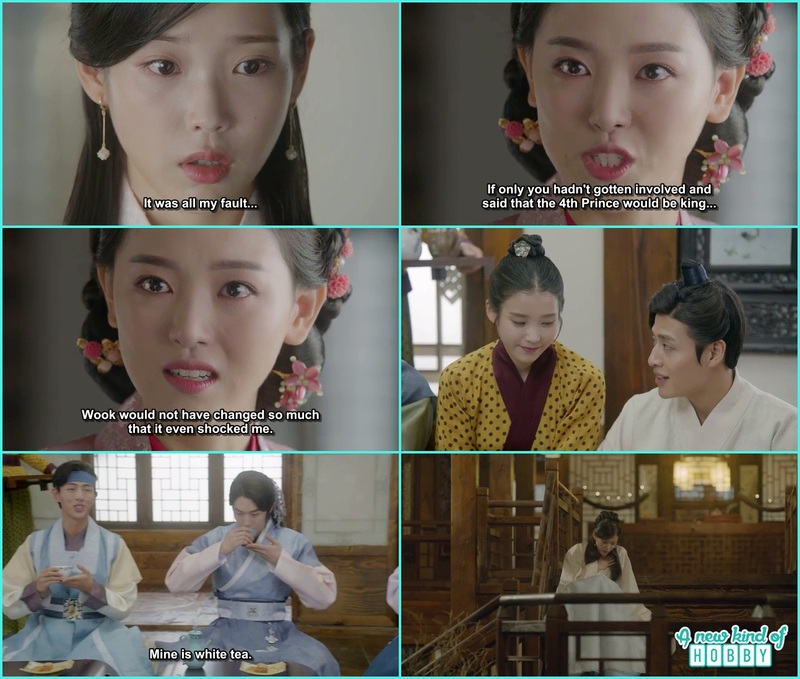 Remembering King Yoo's wording it reminded Hae Soo about King Moo death along with the precautions she said to Wook about 4th Prince Wang So not to get in his way and just avoid him. 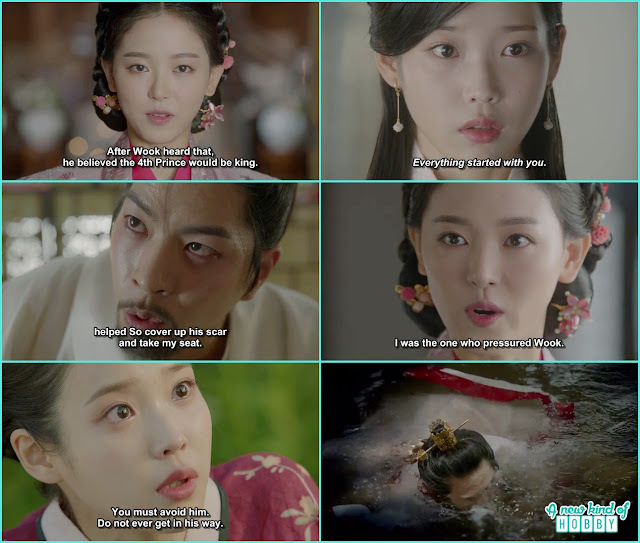 Making Hae Soo full of grieved and treating her like a criminal Queen Yeon Hwa didn't put a stop to her mouth and continue teasing Hae Soo That she is too shameless if she hadn't said 4th Prince would be the King things didn't go wrong as of now and also Wook wouldn't have change into a beast. These words remind Hae Soo that how happy all the princes were in King Taejo's region. Every one was smiling laughing playing with each other. Also she make tea for them in Damiwon. There were smiles and laugh every where.